Ion soft-landing distributes negative POM ions (bright spots) evenly onto a supercapacitor, leaving unwanted positive ions behind. Image: Venkateshkumar Prabhakaran/PNNL. A new technique for making electrodes can produce hybrid batteries that charge faster and possess significantly better electrical capacity and long-term stability, say researchers from the US Department of Energy's Pacific Northwest National Laboratory (PNNL) and the University of Oregon. Known as ion soft-landing, the high-precision technique resulted in electrodes that could store a third more energy and had twice the lifespan compared to those prepared by a conventional method, the researchers report in Nature Communications. Straightforward to set up, the technique could eventually lead to cheaper, more powerful, longer-lasting rechargeable batteries. "This is the first time anyone has been able to put together a functioning battery using ion soft-landing," said PNNL chemist and laboratory fellow Julia Laskin. With ion soft-landing, the researchers were able to build an electrode surface very specifically, containing only the most desirable molecules out of a complex mixture of raw components. "It will help us unravel important scientific questions about this energy storage technology, a hybrid between common lithium rechargeable batteries and supercapacitors that have very high energy density," said lead author, PNNL chemist Venkateshkumar Prabhakaran. Although lithium-ion rechargeable batteries are the go-to technology for small electronic devices, they release their energy slowly. This is why hybrid electric vehicles use gasoline for accelerating and take a long time to recharge, making electric vehicles slower to ‘fill’ than their gas-powered cousins. One possible solution is a hybrid battery that combines a lithium battery's ability to hold a lot of charge for its size with a fast-charging supercapacitor. PNNL chemists wanted to know if they could make superior hybrid battery materials with ion soft-landing. To find out, Laskin and her colleagues created hybrid electrodes by spraying a chemical known as polyoxometalate (POM) onto supercapacitor electrodes made of carbon nanotubes. Off-the-shelf POM contains both positively- and negatively-charged ions, but only the negative ions are needed in hybrid electrodes. Limited by its design, the conventional preparation technique sprays both positive and negative ions onto the carbon nanotubes. Ion soft-landing, however, is able to separate the charged ions and only set down the negative ions on the electrode surface. What Laskin and her team wanted to find out was whether this ability would help in developing a better hybrid battery. To find out, the team made centimeter-sized square hybrid batteries comprising a specially-developed ionic liquid membrane sandwiched between POM-carbon nanotube electrodes. "We had to design a membrane that separated the electrodes and also served as the battery's electrolyte, which allows conduction of ions," said Prabhakaran. "Most people know electrolytes as the liquid sloshing around within a car battery. Ours was a solid gel." They made versions of this hybrid battery containing electrodes made with a conventional technique known as electrospray deposition and with ion soft-landing. They then tested how much energy these mini-hybrid batteries could hold and how many cycles of charging and discharging they could handle before petering out. The team found that the POM hybrid electrodes made with soft-landing had a superior energy storage capacity. They could hold a third more energy than the carbon nanotube supercapacitors by themselves, which were included as a minimum performance benchmark. And soft-landing hybrids could hold about 27% more energy than conventionally-made electrospray-deposited electrodes. To make sure they were using the optimal amount of POM, the researchers tested the energy storage capacity of hybrid electrodes containing different amounts. Soft-landing produced the highest capacity overall using the lowest amount of POM, indicating that the electrodes used the active material extremely efficiently. In comparison, conventional, sodium-based POM electrodes required twice as much POM material to reach their highest capacity. Although the conventionally-made devices used more POM, the team couldn't count them out yet, because they might have a longer lifespan than electrodes produced by soft-landing. To test that, the team charged and discharged the hybrids 1000 times and measured how long they lasted. As they did in the previous tests, the soft-landing-based devices performed the best, losing only a few percent capacity after 1000 cycles. The naked supercapacitors came in second, and the sodium-based, conventionally-made devices lost about double the capacity of the soft-landing devices. This suggests that the soft-landing method has the potential to double the lifespan of these types of hybrid batteries. The team was surprised that it took so little of the POM material to make such a big difference to the carbon nanotube supercapacitors. By weight, the amount of POM made up just one-fifth of a percent of the amount of carbon nanotube material. The researchers decided to examine the structure of the electrodes using powerful microscopes in the Environmental Molecular Sciences Laboratory (EMSL) at PNNL. They compared soft-landing with the conventionally-made, sodium-POM electrodes. This revealed that soft-landing created small discrete clusters of POM dotting the carbon nanotubes. 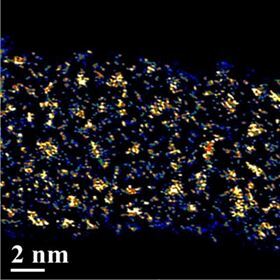 In contrast, the conventional method resulted in larger clumps of POM clusters swamping out the nanotubes; these aggregates were up to 10 times the size of those made by soft-landing. This result suggested to the researchers that removing the positive ions from the POM starting material allowed the negative ions to disperse evenly over the surface. If they weren’t removed, the positive ions appeared to cause the POM and sodium to reform the crystalline material and aggregate on the surface. This prevented much of the POM from doing its job in the battery, thereby reducing capacity. When the team zoomed out a little and viewed the nanotubes from above, the conventionally-made electrodes were covered in large aggregates of POM. The soft-landed electrodes, however, were remarkably indistinguishable from the naked carbon nanotube supercapacitors.